Driveways and parking lots are a major component of the function and appearance of your home or business. Now is the time for extra attention to exterior maintenance. As colder months approach, performing a few easy preservation tactics can help prevent potholes, cracks and pooling water. Protect your investment now to ensure signs of deterioration do not appear next spring. Here are some tips to prepare your entryways and parking areas for the damp, cold and icy weather to come. 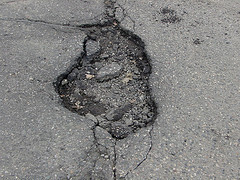 An accumulation of pavement debris -- such as loose aggregate combined with plant materials -- not only is unsightly but also hides perils, such as broken glass and surface damage. Regularly using a blower and sweeping pavement protects people, pets and vehicles using your driveway or parking lot. It also protects your investment by revealing problems, such as cracks, that may require only minor repair if discovered early on. However, if debris accumulates, you allow water to sink into and destabilize the underlayment. This leads to buckling, potholes and sinking pavement. What appears to be a minor crack can become a major pathway for storm water to invade the underlying crushed rock supporting the pavement. A wet sub-base causes more cracks and holes, which lead to greater water damage. Furthermore, the asphalt becomes less capable of bearing heavy loads. Crack-fill materials are available at home improvement stores. However, if your pavement is beginning to crack, professional filling likely will save you time and headaches. Dealing promptly with small damage prevents the necessity of repaving and saves you money. As pavement ages, it grays and becomes brittle. Annual sealcoating can delay the need for expensive asphalt overlays or complete reconstruction of your parking lot or driveway. Sealcoat is a water-based product that contains an emulsified mixture of asphalt or coal tar with clay and finely ground mineral materials. The seal hardens as the water evaporates. It makes pavement look dark and shiny. Sure, it's fun to watch birds frolic in puddle-filled dips in your pavement. But a puddle can transform into a costly pothole, if the accidental birdbaths becomes a miniature pond. So when standing water becomes a standing problem in your driveway, call in a professional company. Although correction may be as simple as patching to create a level surface, it can also be as complicated as installing a drain. Regularly performing pavement upkeep supports the ability of your driveway or parking lot to withstand heavy loads. Another intervention is to limit access of heavy vehicles. One way to do this is to move garbage containers to the edge of your pavement so garbage trucks can access them directly from the road or alley. If large vehicles, such as semi-trailer trucks, must enter your property, it may be necessary to reinforce certain areas of the pavement for heavier traffic. A parking lot that is well prepared for all seasons is a dress-for-success choice for business. Similarly, a home driveway that is well prepped for winter is less likely to present unpleasant, unattractive, expensive surprises come spring. Our experts at Wolf Paving can help you maintain your asphalt and prevent the need for major corrections. Contact us today to set an appointment for a free estimate and to receive information about our products and services. We provide the support that you and your pavement need.